Today we farewell Lou Abrahams; past commodore, life member, skipper, mentor, friend and role-model for so many of our members, who passed away yesterday. As Commodore of the Club that Lou loved so much, I speak for all 2,600 Members in paying tribute to Lou. Lou joined SYC in 1964 and sailed a succession of fast yachts in a career spanning some 50 years that resulted in success at many of the world’s premier yacht races, from the famed Sydney Hobart, to the Clipper/Kenwood Cup in Hawaii, the Admiral’s Cup in England and numerous other events around the world. As early as 1970 Lou was making a name for himself in sailing, originally with the first racing yacht he owned, Odin, then with Vittoria – the first Victorian challenger in the Admiral’s Cup. Next came his series of boats incorporating the ‘Challenge name that became well known throughout Australia and overseas for successes in Sydney Hobart races, Hamilton Island, Hogs Breath and Geelong Race Weeks, Victorian Association Cup teams, Club races and those international events mentioned above. Among the significant awards Lou received is the Australian Ocean Racer of the year in both 1984 and in 1990. Additionally, in 1983 he was awarded the Victorian Yachtsman of the year and in 2006, the Veteran Ocean Racer of the Year. In 2002 Lou received a Commonwealth medal for Services to Sailing – well deserved after fifty years of unassuming but extremely successful involvement in sailing and the Services to Yachting award in 2006. Stepping back to the 60’s, 1963 to be exact, marks the beginning of Lou’s long association with one of the world’s great events, the Sydney Hobart Yacht Race. It was Sir Arthur Warner who took the then 36-year-old Lou on the famed Winston Churchill as his bowman. Lou would complete 44 consecutive races, the last in 2007 aboard Challenge. Lou and his team have competed in seven Fastnet races, held each year in England, and he has been quoted saying, “It’s not quite as tough as the Hobart, as half of it is OK – if you beat there, you run back - but it does fog up a lot”. Challenge II (C2 or the Big Red Boat) followed Vittoria. The S&S 45 was campaigned from 1979 to 1983, and provided his first Hobart win in 1983. 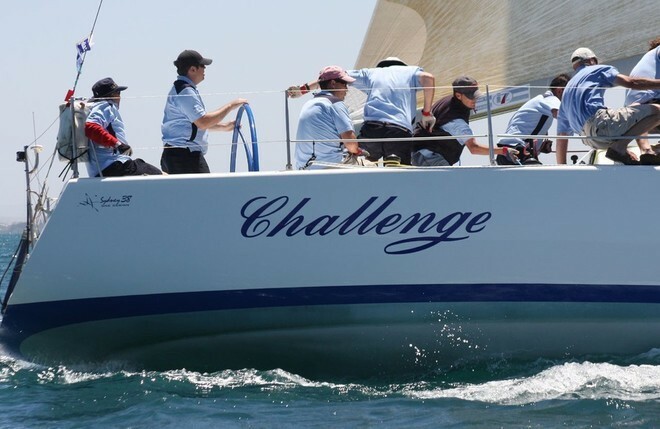 Challenge III was from ‘84 to ‘87, with the carbon fibre Frers going off to compete in the 1984 and 1987 Admiral's Cups and also represented in the 1986 winning Australian Kenwood Cup team. From there, it was Challenge Again and Ultimate Challenge the Ed Dubois IOR one tonner which provided Lou with his second Sydney Hobart win in 1989 and a close second in 1991, and other top results with many an overseas trip included up until 1995. Another Challenge, the Sydney 38 came next, and then an updated model - Challenge - followed shortly after, as he fully committed to One Design. Lou and his crew won the Sydney 38 National Championship four times and all but one Victorian Championship since its inception. Lou’s crew is a close knit group who have the highest regard for their skipper; his professionalism, seamanship, good humour and, above all, consider Lou a real gentleman and great skipper. There was much more to Lou Abrahams than a successful sailing career. As Commodore from 1972 through to 1973, he introduced a level of professionalism and business acumen that was instrumental in the continuing development of the Club. But mostly, we remember Lou’s passion for doing what he could to ensure as many as possible could share his love of the sea and sailing. As a youngster, I was fortunate to crew for Louie on Vittoria in the 1973 Hobart race; he believed in giving the young every opportunity. An indication of the extent of the crew ‘family’ that Lou fostered, was the crew reunion organised some years ago with over 150 attending, some coming from overseas and many from interstate. The juniors at SYC had a true champion and a great supporter in Lou Abrahams. One of his happiest moments was at the opening and appropriate naming of the Lou Abrahams Off the Beach Sailing Centre. Lou often attended the Off the Beach annual presentation night and the juniors were thrilled to receive their trophies from Lou. Lou Abraham’s fingerprints are all over SYC and we are all proud to have known him, while many of us are privileged to have sailed with him. To Joan and the family, the thoughts and regard of the SYC community and, indeed, the wider sailing community, are with you. Farewell, Lou - looks like you will be first to the top mark again. Funeral details are currently being finalised and will include a service followed by a celebration of Lou’s life back at Sandringham Yacht Club. All will be welcome to both and details will be advised when finalised.